Can 1 remote control 3 fixtures. Each fixture needs to be controlled with it's own controller. Used it to replace to replace an old set of fluorescent bulbs for a 55 gallon, and couldn't be happier. Colors look good and plants are growing great. If you use the 24/7 setting in a well planted system it means you can even cut out a timer from your system. The light on stock can be a bit bright for smaller tanks, but you can fix that with programming. I purchased a Finnex 24/7 Planted Plus (36 inch) LED light for my new 40 gallon heavily planted community tank. I really did my research before purchasing a light and the Finnex 24/7 had the best options all round. THe LED system works great. The light is clean and has a great spread and depth of penetration. The weather settings are very cool and because the light has a a built in 24/7 feature you don't need to ad a timer to what is most likely a very crowded power strip. The light is sleek and very well designed and even somewhat robust as long as your not swinging it above your head like a wild animal. Compared to the hideous hood my 40 gallon tank came with it, the Finnex is high style. I like the leg set up too. My one and only complaint is that the 24/7 option can be a little tricky to use, but if you follow the directions to the letter and be patient you can get some great results. (Even with this issue this light is still huge leaps and bounds better then a Marineland or National Geographic LED light you might purchase at a big box store. Cost wise it is also very competitively priced. I watch and read a lot of review when looking to replace the standard hood and bulbs on my 55 gallon. Mixed reviews all over, Aquacave had the best pricing I could find so I have it a shot as I wanted a planted tank. Stylish, functional and perfect! This light delivers the best bang for the buck. My fishes colors pop and my plants are thriving. Crisp clear bright whites and a subtle blue moonlight along with other functions such as cloudy day, thunderstorms (which I don't use as not to stress the fish). The 24/7 mode is great if you put it town and no need for timers. Even with the light above the glass lid the plants still grow well at a depth of 18". I could have spent more money on different lights but no need with this one. At the current price point by Aquacave this is a deal hard to pass up. In fact I will be ordering a 2nd one for a more even spread of light due to floating plants. Can't say enough good you just have to see it and try it yourself. 20+ years of aquarium experience. I have used almost every form of aquarium lighting. These are the best I've ever used, bar none. My tank turned green within 48 hours. the color rendition and brightness is superb and the automatic functions of the day night are the easiest to use. I own 4 of these and will buy more. I highly recommend these you will not be disappointed. 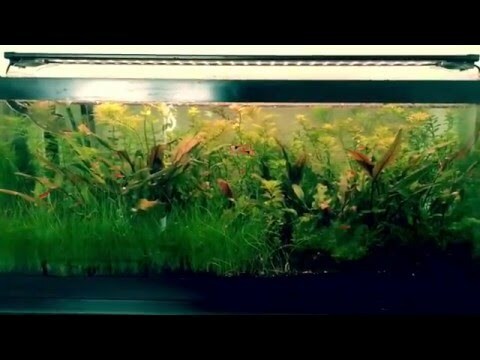 When I recently wanted to improve the light quality for the various community fish and live plants in my 55-gallon freshwater tank, AquaCave suggested the Finnex 48" unit. My concern regarding bright light penetration to 21" of depth is no longer an issue. When you add in the 24/7 timer feature and the ability to create custom color settings; all other LED light bars just aren't in the same league. I was especially pleased to find that this light bar is extruded aluminum and doesn't sag in the center (48" clear span) like other plastic models. I had two separate 24" dual t5 high output, but my plant growth wasn't doing well. After the ballasts went in those units, and they were from a brand were repair wasn't easy, I decided to make the switch to lcd. After some research, I decided on the finnex 25/7. Aquacave had the best price, so I ordered not knowing what to expect from them. Two days later, it was delivered. Packaging was good...they took the time to buffer the box by twisting heavy paper around it to form a cushion. The care of packing, the quick delivery, and the good price will have me coming back when I'm looking for my next upgrade. The product itself is nice. I have a glass cover on my 55 gallon, so I opted to place the light on the top of the frame and kept the supplied mounts for future use (if needed). The unit does not get nearly as hot as the previous t5 units. I like the 24/7 setting...the shifting colors augments the fish in various ways that I like (I have tetra based community tank). The separate memory slots for colors is useful too and I find I switch back and forth. The brightness of the tank is similar to the four 24" t5ho I used before. I was expecting this unit to be a bit brighter, but I'm actually glad it isnt. My plants are doing better than before, but not amazing. I expected this though, and planned on getting amother light source to use during the day for plant growth. This unit will be perfect for low light plants, and probably most mid light plants. It will not be enough for high lights, however, unless you have another plan in mind. Overall, I am very pleased with the unit. I like the fact I could still use my glass cover, I like the 24/7 setting, I like the brightness and the ability to program my own setting outside the 24/7. I am also very pleased with aquacave and recommend them.